What is the provenance of this statement – who said this, when did they say this? What is the temporal scope of this statement – when did DC became a capital of the US, is it still the capital? What is the access control for this statement – who can see it, who can change it? Interest in this topic is evidenced by Paul Hermans’ blog summarizing recent discussions on approaches to implementing such metadata http://www.proxml.be/users/paul/weblog/9d47d/A_must_read__Temporal_Scope_for_RDF_Triples.html. We often get asked what is TopQuadrant’s recommended approach to supporting statements about statement – for versioning, for governance, etc? TopBraid Suite is fully flexible in this respect and can be used to implement any number of approaches. However, in our work, we found an approach based on RDF reification to be particularly useful. We often extend this model for particular applications to add the metadata required by the app, for example, author or scope. TopBraid Composer inserts change statements automatically. Every time there is a triple is added or deleted, there is a new change statement. In web applications deployed under TopBraid Live, we use a SPARQLMotion scripts that start with sml:TrackChanges module. 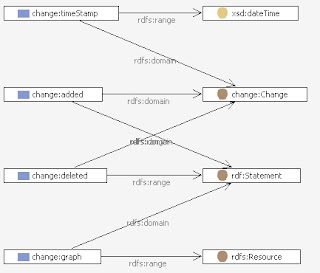 Sml:TrackChanges is used to implement services that shall be executed as a side effect of a change to an RDF model. In TopBraid, any script containing an instance of this module will be executed as part of each change. The output of this module is using the http://topbraid.org/change ontology, with triples describing the changes that have happened. In other words, TopBraid listens for the changes and, when a change happens, it will trigger execution of a script(s) containing TrackChanges module. One can provide a filter to specify what type of changes a script should react to. And, as with any SPARQLMotion script, what happens when the script is triggered is up to the script designer. For example, in the Enterprise Vocabulary Management solution we use this approach to stamp every change with the author id and a timestamp and also to trigger the governance processes – send e-mails about the changes to the appropriate parties, promote approved changes, etc.